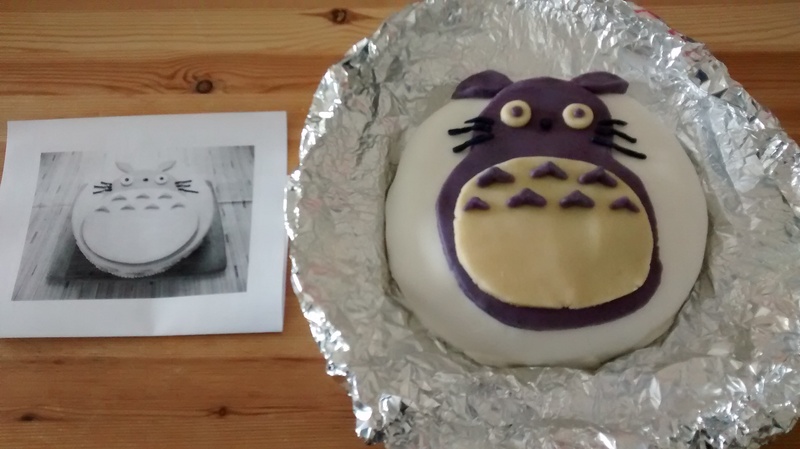 It was Andy’s birthday last week, and we have a bit of a tradition now for me to make an extra Christmas cake and keep that for his birthday. 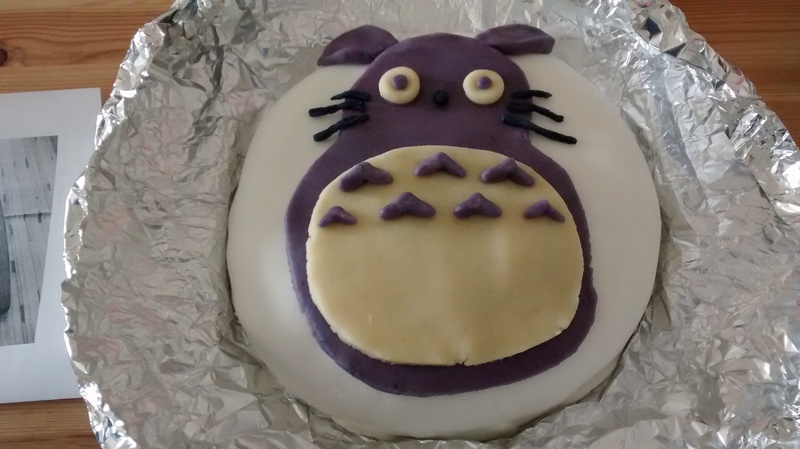 This year I decided on a Totoro design, as I am having a bit of a Studio Ghibli phase. 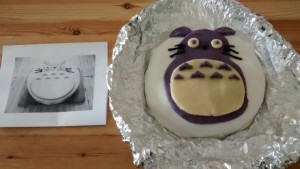 I saw loads of amazing cakes on the internet, but they were all rather tricky! It took me a while but I finally found a nice simple one to copy. Plus, as a bonus, what I thought was a pack of icing, turned out to be white marzipan, so the decorations are going to be tasty too! Onto the new strap. My Garmin vivofit has a little “keeper” to go around the strap and make sure it doesn’t accidentally come undone. I didn’t think it needed it, but wore it anyway. But then when I fell over in the half marathon, the keeper broke, and I have missed it- a couple of times the strap has come undone- only when I have been taking my coat off or something. 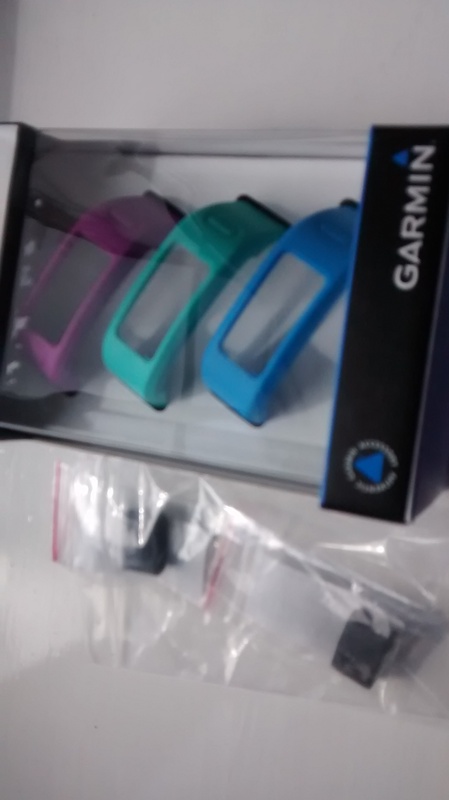 I knew you could get coloured straps, so I spent ages on ebay and amazon, trying to find the keepers. In the end I found a set of 3 straps, and emailed the seller asking if they included the keepers (as some reviews said they did, and some didn’t). He said they didn’t but as he had some spares he would include them with my order, which was very kind. They came in the week so I just added the keeper to my strap, but at the weekend decided to try out a different colour. 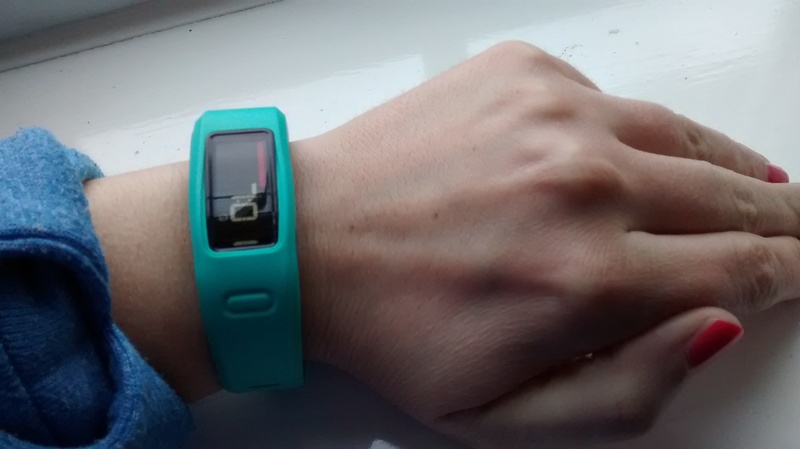 It was so easy to un-clip the main part and clip it into a new strap- not sure why I didn’t try it sooner! A world of colour awaits (well, of three colours anyway). 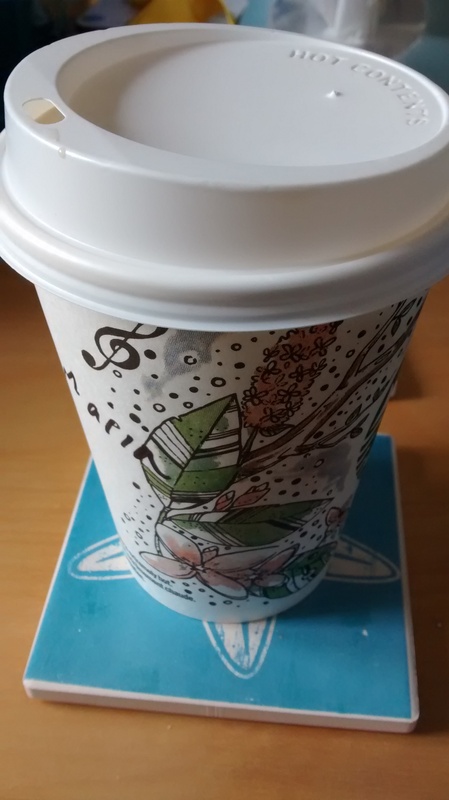 After my cake decorating I fancied a walk so drove near to town and walked the mile in, got a Starbucks and walked back, listening to some podcasts for some lovely “me” time. This week I have been on holiday still, and so have been trying to get my two portions of fresh air each day, either with a couple of walks, or a run and a walk. As I have been report writing it has been very nice to have a break and stretch my legs- I do not know how people work at computers all day for their jobs! Running has been going OK- I feel very paranoid about falling, and have been going at a very gentle pace, but I have been fine afterwards and have been stretching once I get home too. After our parkrun tourism on Saturday I had a rest day on Sunday, then on Monday morning had a nice longer run (7 miles) which was enjoyable, although I pottered around for ages first, so despite being awake at 8am, didn’t leave until about 9.30 so I was rather hungry by the time I got home for breakfast. Part of my route is through this field, and it took me by surprise that there were horses in the field, one right by the gate. 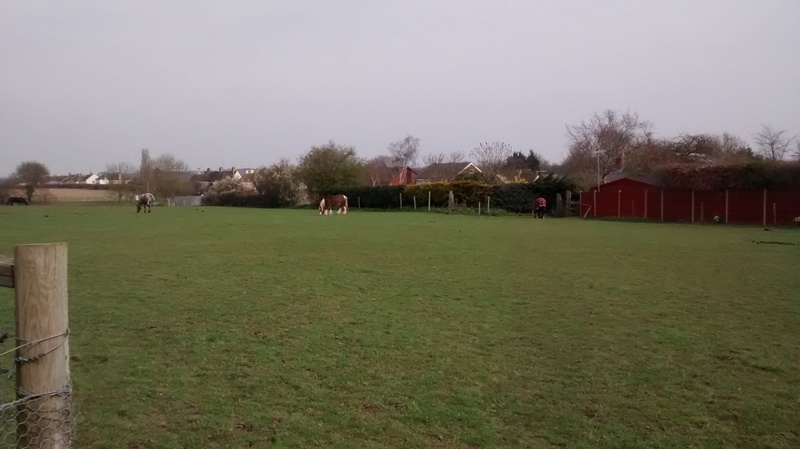 You can miss the field out, but it’s a much longer route, and the horses seemed more interested in the grass than me so I decided to go through. If it had been the cows with big horns I would have gone the long way around I think! 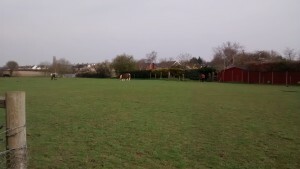 Taken once safely through the field! Yesterday I had a lovely run with the club- I have not been out with them for ages, but we found a route that was just under 4 miles and completed it while catching up with each other. It was really enjoyable, and so good to finish in daylight. The cake sounds and looks amazing. I adore Christmas cake – what a great idea to save some for a later date when you’re read for it again after a break. Yeah I don’t know how I work on a computer all day either. I need to go for regular mini-walks to get drinks and get outside for lunch. And standing all day helps so much more as well! Yes a standing desk is such a good idea- I think if I worked at a computer I would sort one of those out as I get so stiff sitting down. I’ve saved one cake for the last few years as Andy loves fruit cake, plus the recipe makes either 2 or 4, and I need 3, so there is always one left over! I love Christmas cake, but I haven’t had it as a birthday cake before. Maybe that is something that I need to try for my birthday this year. Well, if you like it, why not? I always wear the keeper on my Vivofit. When my strap broke last year (I think from drying out with all the painting I had been doing over the Summer), Dan picked me up some new straps and a couple of times I’ve swapped to different colours. It is really easy to pop the watch part in and out of the straps to mix things up a little! 😉 I made sure to get a black one this time though for future weddings! It’s lovely to run in daylight in the evenings now. I do enjoy Winter running, but there’s only so many months of leaving for work in the dark and arriving home again in the dark that I can take! I am not sure why I thought it would be difficult, but yes it’s so easy to pop the watch bit out.I do like the green colour so I am keeping that at the moment. I love the cake! You are very good! I have to admit that if there is only one thing I could change about my UP3 it would be to have a keeper on it. I always catch it, but it would be good to have an extra safety mechanism. To be honest, there are days when I don’t know how I live in my desk job all the time. Lately, I have had some big pieces or work to do and I have literally been desk bound for days. Not good. Sympathy your way for the desk situation! The keepers are a good idea- I think the later models have more like a watch clasp which is a bit more stable, but I do catch it a lot so am glad as I would not want to lose it. I’m prompted to go and get some tea now… Must Keep Moving. Wow you are very restrained if you still have Christmas cake left! I am impressed! Ha ha, yes, I keep forgetting to take my reusable cup with me- I remember when I get there… They are pretty but I like the bigger cups more, but then I could not really drink a whole big one to myself!